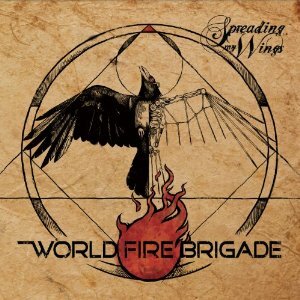 World Fire brigade is a band whose members have sold over 10 million records between them. You have Brett Scallions (Fuel), Sean Danielsen (Sile empty soul), and Eddie Wohl (producer for Anthrax, Ill nino, 36 crazy fists amongst others). So these guys clearly have experence in the music industry. They teamed up and started writing songs with the intention of licensing them out for other artists to record/perform but soon decided that the material they were writing was too good for them to want to give it to other artists, so they decided to record and release the songs themselves, and thus World Fire Brigade was born. "The end of silence" isn't a song as such - it's just a short intro to the album. It's quite soft which means that when "Spreading my wings" kicks in at full power with the pounding drums and roaring guitars then it really makes you sit up and take notice. Despite the heavy start to the song it soon settles down to a slightly less heavy rhythm. "Weight of the world" is a great song that will definitely appeal to any Nickelback fan - it's got a very similar radio-friendly commercial feel to it and is a song that is likely to get this band a whole load of fans. Any Nickelback fans really need to buy this album as this album is really going to appeal. It's got that same radio-friendly feel to it, with a similar vocal style. It's perhaps slightly heavier than Nickelback are on their albums but is no heavier than they are live. "Spreading my wings" is out now via Frostbyte media.